"Back, back, over the falls!!" World Showcase is the second themed area of Epcot, after Future World. Nine of the pavilions opened with the park's opening on October 1, 1982. Morocco opened in 1984, and Norway in 1988. Very few major changes have occured in World Showcase. The following is a breakdown of the eleven countries in World Showcase (starting clockwise from Mexico) and what changes they have gone through over the years. Mexico's landmark is a Mesoamerican pyramid. Mexico's attraction El Rio del Tiempo had the working name "Las Tres Culturas de Mexico" ("The Three Cultures of Mexico") - representing those cultures found within the ride: ancient, colonial, and modern. El Rio del Tiempo began in the ancient times with Aztec and other native rituals being played out on video screens. It then moved on to colonial times with many festive dolls singing. The song was carried over into the modern era where Mexican beach resorts are seen. Along the way, some eager merchants frantically try to sell you stuff. The final scene was a large fiesta under ceiling-projected fireworks, alongside a marionette carousel. El Rio del Tiempo closed in January 2007. It reopened in April of that year as Gran Fiesta Tour - Boat Cruise Starring the Three Caballeros. The new ride differs with the original in a only few ways. All of the video screens now feature Donald, Jose, and Panchito, with their Mexican amigos. The section with the dolls remains very much the same. With the dolls, a Donald pinata can now be seen. The marionette carousel is now replaced by a large video screen showing the trio in concert. Mexico opened with two restaurants in 1982: San Angel Inn and the outdoor Cantina De San Angel. In 2010, the Cantina went under reconstruction. In September of that year, it reopened as "La Cantina De San Angel" and "La Hacienda De San Angel." Like the old Cantina, La Cantina serves fast food, but has outdoor and indoor tables. For dinner, the building is also La Hacienda, a table-service restaurant. Norway opened in May 1988 with its attraction Maelstrom opening later in July of that year. Its landmarks include a Stave Church and the Akershus fortress. In 1998, a wooden Viking Ship play area was added just outside the restrooms. The ship was dismantled in 2008. Pieces of it can still be seen in its old location. The exhibits in the Stave Church have changed from time to time. Around 2005, the Akershus restaurant began to feature Princess Storybook Dining. China's main landmark is the Temple of Heaven. China's attraction is a 360 degree film. It was originally "Wonders of China," but changed to a different film called "Reflections of China" in 2003. China has also had some different exhibits over the years including one on Hong Kong Disneyland. Both of China's restaurants, Lotus Blossom Cafe and Nine Dragons Restaurant did not open until 1985, three years after the pavilion opened. Germany is set in an old German town platz with a risen statue of St. George and the Dragon. Very little has changed at Germany over the years with the exception of some of the merchandise sold at its shops. At one time Disney PVC figures, such as Uncle Scrooge and Gyro Gearloose, were sold at its Der Teddybar shop. A planned but never-built attraction for Germany was the River Ride. The ride would take guests on boats down rivers of Germany including the Rhine River. The boat ride would showcase elements of Germany's past and present. Italy is set in the city of Venice with the Doge's Palace and campanile (bell tower). Italy's restaurant was originally L'Originale Alfredo di Roma Ristorante. It changed to Tutto Italia Ristorante around 2007. In August 2010, Italy received another table-service eatery called Via Napoli. Situated at the back of the pavilion, it specializes in pizza. An area themed after southern Italy and the Roman ruins was planned to be built by 1983, but never was. The American Adventure's landmark is a Georgian mansion, housing its attraction also called "The American Adventure." The film finale of the show was updated in 1992 and other years since. Two of Japan's landmarks are the torii (gate of honor) and the goju-no-to (five-story pagoda). Its Bijutsu-kan Gallery has housed many exhibits including ones on carved miniatures, Samurai armor, puppets, baseball items, and tin toys. A planned but never-built attraction for Japan was a film called "Meet the World." The film would introduce Japan with the formation of its islands through volcanoes. Along with an animated magical crane, Japanese children would discover the past of the Japanese people. Scenes in the film would include the Great Buddha at Nara and a scene from the twelfth-century "Tale of Genji." At the end, the crane and children would bid guests goodbye from a balloon's gondola. Morocco opened in September 1984. Its landmarks include the Koutoubia Minaret of Marrakesh, the Nejjarine Fountain of Fez, and the Bells of Medersa. Unlike the other World Showcase pavilions, some of Morocco's detailed architecture was done by actual Moroccan artisans and craftsmen sent over by the Moroccan king at the time, Hassan II. France's landmark is the Eiffel Tower, sitting beyond the entrance to the Palais du Cinema. The building houses France's attraction, a 180 degree show called "Impressions de France." The United Kingdom is set along British streets: Tudor Lane, High Street, and Upper and Lower Regency streets, along with a waterside pub. Canada's landmark is the Hotel du Canada's French Gothic, surrounded by the Victoria Gardens on one side and totem poles on the other. A new totem pole was carved for the pavilion in 1998. Around the year 2004, Trapper Bob's closed down in the Canada area. Trapper Bob's featured the Beaver Tail, a flat doughnut-like pastry that could have multiple toppings. The small cabin that housed the tails remains, but does not sell them anymore. The pavilion's 360 degree show, "O Canada!," was updated in 2007. The new version reuses some clips from the original show mixed in with new ones. Most notably, the new version is hosted by Canadian-born actor Martin Short. The song in the finale has been rerecorded with a new vocalist. Three pavilions were advertised in EPCOT Center books and other material, but never built: Spain, Israel, and Equatorial Africa. From those books, Equatorial Africa seemed to have the most developed plans. Israel would eventually be featured as one of the countries at the Millennium Village. Spain was to have two attractions. The first attraction was a film on vacation spots in Spain. The second attraction was a ride themed around Spain's heritage and arts. Market places and a waterside restaurant serving tapas (a finger food found in Spain) would also be included in the pavilion. Israel's landmark was to be a Menorah in the center of a courtyard. The buildings would be themed after old and new buildings from the area with ancient Jerusalem in mind. The attraction was to be an amphitheater with classical and folk music being performed. Olive and cypress trees would also be part of the pavilion. Food from the country would also be featured. Equatorial Africa refers to the group of African countries that lie along the equator. This pavilion was also referred to as the "African Nations pavilion" and the "Africa pavilion." Equatorial Africa was to be located between China and Germany, where the Outpost currently sits. Equatorial Africa would have tree house-like architecture set in the dark jungle. Foliage, running water, and smells would be present, along with animals visiting a water hole. The animals would be created with rear-projected film. The attractions would consist of two shows and the Heritage area. The first film, called "The Heartbeat of Africa," would show Equatorial Africa's past, present, and an idea of its future. Preceding the film was to be a preshow all about the significance and history of the drum in Africa. The finale of "The Heartbeat of Africa" would present a jazz concert in a modern African city. The climax would feature superimposed laser images coming out of the jazz instruments. The second show, called "Africa Rediscovered," was to be hosted by the author of Roots Alex Haley. Preceding it would be a preshow with a giant relief map of Africa. The preshow would present Africa's natural wonders of flora, fauna, and climate. The Heritage area was to be an African village with live entertainment consisting of traditional performances. The area was also planned to hold a museum of fine African art. The Odyssey opened with the rest of the park in 1982 as a restaurant and complex. Technically part of Future World, it sits in the transition zone between Future World and World Showcase (between Test Track and Mexico). The restaurant served hot dogs, hamburgers, and salads for lunch, and beef stew, fried clams, and sweet and sour chicken for dinner. During the late 80s and early 90s, there was also a live show with characters to entertain guests at the restaurant called "Mickey's Rockin' Celebration." The Odyssey also housed first aid, baby services, and lost children. In July 1994, the Odyssey Restaurant closed, with the building only to be used for special events (the restrooms and services can still be used by everyday guests, though). Currently, the Odyssey is listed as the "Odyssey Center" on the Epcot guide map. For some more information on the crowds, food, and atmosphere of the early days of the Odyssey, read our interview with an Odyssey Cast Member who worked there from 1982 to 1985. The two shops near the center of Showcase Plaza, Port of Entry and Disney Traders, both opened in spring 1987. Found between Showcase Plaza and Canada, the Refreshment Port sells beverages, chicken nuggets and French fries. Between 2001 and 2009, it sold McDonald's items, such as Chicken McNuggets and McDonald's fries. Situated between France and the UK, the International Gateway opened in early 1990. It allows park entry and exit to and from the Epcot resorts: the Boardwalk, the Yatch Club, and the Beach Club. The Outpost sits beteen China and Germany and currently sells beverages and snacks, along with African souvenirs like those found at Animal Kingdom. It opened in 1983 as a placeholder for the Equatorial Africa pavilion. The first fireworks show was Carnival de Lumiere in October 1982. It was followed by New World Fantasy in 1983. In June 1984, Laserphonic Fantasy (also known simply as "Laserphonics") premiered. Laserphonics would last until IllumiNations premiered in January 1988 (presented by General Electric at the time). IllumiNations would continue to be the name of the nighttime show, although it would go through a few different versions. To go with Disney World's 25th anniversary in 1996, IllumiNations 25 premiered. IllumiNations 25 would be shown until it switched to IllumiNations 98 in 1998. In 1999, it changed to IllumiNations 2000: Reflections of Earth. After the Millennium celebration, the show would remain the same but the name would lose the "2000" and just be IllumiNations: Reflections of Earth. It is currently presented by Sylvania, a Siemens company. Beginning in fall 1999 and ending in early 2001, the Millennium Celebration spawned two attractions for World Showcase, aside from the new IllumiNations. They were the Millennium Village and the Tapestry of Nations parade. The Millennium Village, located between Canada and the UK, served as an exhibit area for countries not already in World Showcase. A Brazil rain forest playground and an Israel simulator were among the clustered attractions. After the celebration the Millennium Village was closed down and gutted. The inside now hosts conventions. The Tapestry of Nations parade was Epcot's first parade. It featured large puppets but lacked the Disney characters. The parade remained after the celebration and was rejuvenated for the 100 Years of Magic celebration in 2002, and it was renamed Tapestry of Dreams. When the 100 Years of Magic ended, Tapestry of Nations/Dreams finally came to a halt. Prior to the Tapestry of Nations/Dreams parade, a parade called the Festival of Nations was planned to circle the World Showcase lagoon back in the 1980s. The Festival of Nations parade never occured. The omnibuses were open double-decker buses that guests could ride around World Showcase. For Mickey Mouse's 60th Birthday in 1988, the buses were decorated and loaded with characters. The buses have not been in use for guests for some time now, and they only come out loaded with characters at certain times. Signs on the side on the buses now read "Characters on Holiday." For a few years, the buses would come with characters to entertain guests waiting for the park to open behind the rope in front of Spaceship Earth. Sometime around the year 2000, Kidcot Fun Stops were added to each World Showcase pavilion. They would later spread to a few of the Future World pavilions. The Fun Stops were designed to amp up kids' interest in World Showcase where they could decorate a mask and receive a stamp on their mask handle from each country. In early 2009, the Kim Possible World Showcase Adventure launched. 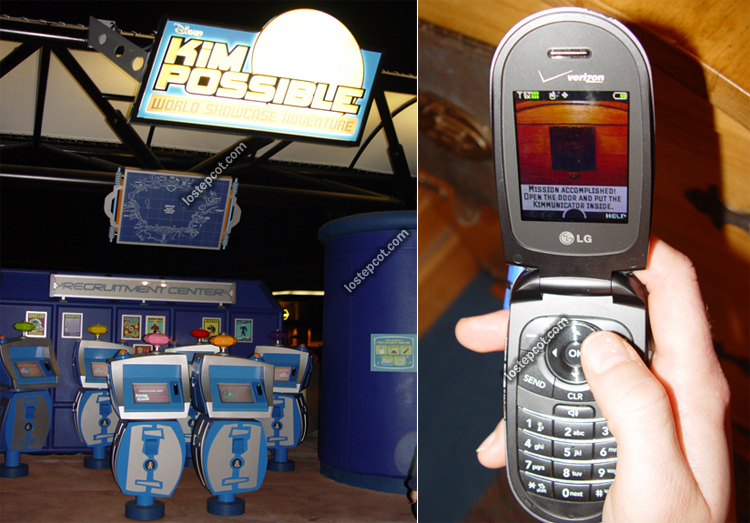 The Adventure allows guests to pick up cell phone "Kimmunicators" and use them to find clues and activate certain objects at seven of the World Showcase pavilions.